The goal of this article is to provide our readers with a simple easy way to how to clean slate floors with proven effective results by using simple tools and supplies. The key to cleaning floors sometimes is to use standard common methods of cleaning. In this case a simple mop and bucket cleaning method does a fine job of cleaning slate floors. However, there are many newer methods that also provide great cleaning results such as a microfiber damp mopping system like a Swiffer Mop from Proctor & Gamble. There are two basic types of slate floors…smooth and rough surfaces. Rough surface slate floors can make the question of “How to Clean Slate Floors” a slight more difficult one to answer because rough surface slate is what commonly called split slate. In the manufacturing process, a slab of slate is actually split. This creates an interesting and beautiful looking floor but also creates a harder surface to clean because it is irregularly shaped and uneven. But using a Standard mop and Bucket cleaning or a Swiffer Mop type system utilizing a Microfiber flat mop will work on split slate surfaces. Of course, if it works on a split slate floor surface it will also work on a smooth slate floor surface. We recommend that the residential homeowner do not use a sponge mop to clean a split slate floor. The uneven edges of the slate floor will grab the sponge mop and tear it making it basically useless. If using a standard cotton mop, we recommend using a banded sewn end mop. This will keep the mop strands flat and held together without tearing up the ends of the mop strands. Sweep with a broom to remove most of the surface dust. Remove gum and other debris adhered to the floor with a Blunt Plastic Scraper. Damp mop entire floor using a mop and bucket method. Best practice would be if using a mop to use a quality microfiber flat mopping system. A quality microfiber system will deliver high performance results with this cleaning procedure. 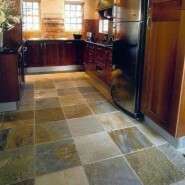 Use a Stone or Slate Floor Cleaner or Neutral Floor cleaner using them according to label directions. Remove black marks and scuffs with light duty white pad or tennis ball.